Okay, so this book as been a looooooong time in coming! 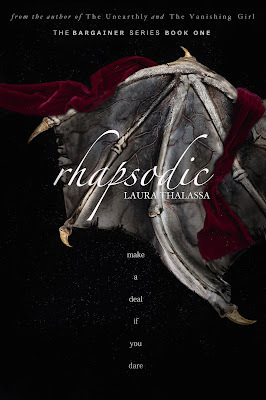 I started talking about Rhapsodic back in early 2014, when it was called Moonlight Rhapsody and going to be part of an anthology, but the anthology never went through, so I set out to publish it separately. Only ... the idea for The Queen of All that Dies shoved its way in, and I decided to write that series first. So I set Rhapsodic aside--until now. Rhapsodic is the first book in a NA paranormal trilogy that stars a siren with an armful of magical beads, each one an IOU that she has to repay to the king of the night. I'll have more info on this in the coming months, but let me just say that I am ecstatic to finally get to pick this story back up! It's going to be dark and fun and full of thrills. If you want to read some teasers I've already posted on the novel, you can browse through them here. These teasers are subject to change since I haven't touched what I've written in over two years! If you want to read the description, I've included it with the cover below! Okay, onto the cover. 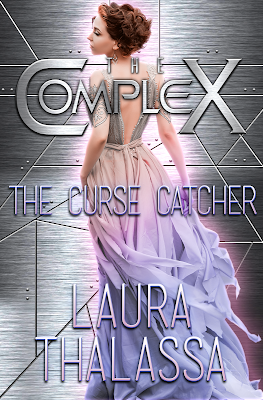 *Sigh* I think this cover might be my favorite one yet! It's fairly different from my other covers, but I hope you like it anyway! Ten years ago I bought an armful of favors from a very bad man, a man only fools and desperate people call upon. They call him the Bargainer, but I know him as Desmond Flynn. If you need a favor, he’s the man to go to. He can fulfill your heart’s desire. But every favor comes at a price, and once the Bargainer commits to his side of the deal, you’re magically bound to fulfill yours. Only death can sever that obligation—and trust me when I say the Bargainer doesn’t let that happen. I've waited ten long years to repay my debts. Ten long years to forget my dark past and the man who's haunted it. But that all ends today. Desmond Flynn has finally come to collect. Blood on my hands, blood between my toes. It’s splashed across my chest, and to my horror, I can taste a few droplets on my lips. There’s far too much of it staining the kitchen’s marble floors. No one can possibly survive that much blood loss, not even the monster at my feet. My entire body shakes, adrenaline still pumping through my veins. I drop the broken bottle and fall to my knees. Blood soaking into my jeans. I stare at my tormentor. His glassy eyes have lost their focus. If I were a braver person, I would’ve placed my ear to his chest to just make sure that his cold, blackened heart had stilled. I can’t bear to touch him, even now. Even if he can no longer hurt me. He’s gone. He’s finally gone. A shuddering sob pushes its way out of me. For the first time in what seems like an eternity I can breathe. I sob again. God it feels good. This time tears follow. I’m not supposed to feel relief. I know that. I know people are supposed to mourn the loss of life. But I can’t. Not him, anyway. Maybe that makes me evil. All I know is that tonight, I actually faced my fear and I survived it. He’s dead. He can’t hurt me anymore. He’s dead. It takes only a few more seconds for that realization to hit me. My hands begin to shake. There’s a body and blood, so much blood. I’m drenched in it. It speckles my homework, and one fat droplet obscures Lincoln’s face on my history textbook. A harsh shiver courses through my body. The air feels different now that death has touched this place. I stare down at my hands, feeling like Lady Macbeth. Out damned spot! I dash to the kitchen sink, leaving a trail of bloody footprints in their wake. Oh, God, I need to get his blood off of me now. I rinse my hands furiously. The crimson liquid stains my cuticles and it's embedded itself beneath my fingernails. I can't get it all off before I notice blood also coats my arms. So I scrub those. But then it’s on my shirt, and I can see it congealing in my hair. I whimper as I work. It doesn’t matter. It’s not coming out. 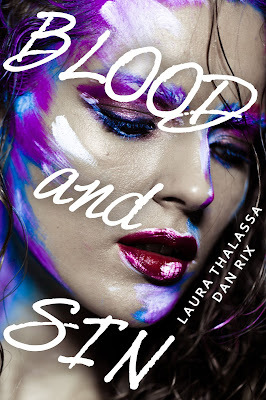 I lean over the granite countertop and assess the pink admixture of blood and water that stains it, the floor, and the sink. Reluctantly, my eyes slide to the body. An illogical part of me expects him to sit back up and attack me. He’d always seemed like some terrible force of nature. Why would a little thing like death to stop him? When he doesn’t do just that, I begin to think again. What … do I do now? Call the police? The justice system protects minors. I’ll be okay, they’ll just call me in for questioning. Nausea rolls through me. No, I can’t do it. The monster bleeding out in our kitchen knew a man who knew a man. Someone that could clean up a messy situation. I only had to sell a bit of my soul to speak to him. I dash to the junk drawer, my trembling hands having trouble opening it. Once I do, it’s short work grabbing the business card and reading over the peculiar contact information. Fear washes through me. If I do this, there’s no going back. My gaze sweeps over the kitchen. It’s already too late to go back. I take a deep breath and do as the business card instructs. If you enjoyed that, click here to add Rhapsodic on Goodreads. If you'd like to receive an email when it comes out, you can join my mailing list in the top right hand corner of this page. I was going to make this a video, but uploading it takes forever and I didn't want readers to have to slog through the entire thing to get to info they wanted to know about. So what exactly is this? It's a post that goes over some of the questions that you all might have concerning The Queen of All that Lives. 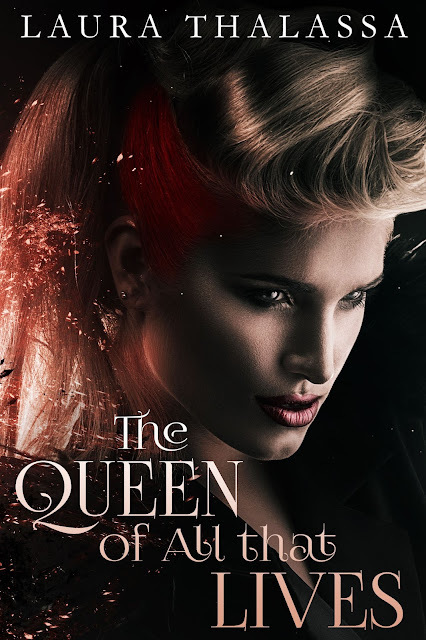 Let me emphasize this: This post is for people that have already read The Queen of All that Lives (The Fallen World #3). It contains SPOILERS, so if you want to read this book, I'd stop right where you are and leave this page. Below I'm inserting a photo of the book to hide the spoilers that follow. If you're interested in reading The Queen of All that Lives, you can click on the image, or you can click here. Alright, so if you've made it this far, let's begin! So, at the end of the book, you find out that Marco is a double agent. But if Marco is a double-agent, why is it that he didn't prevent all those times that his life and Serenity's and the king's were in danger when he supposedly could've? The thing about Marco's relationship with the representatives is that it's unequal. Just like we saw with the reps and Serenity, they don't hold their allies on equal footing. The representatives don't tell Marco everything. The attack on the plane, for instance, was an off-the-cuff decision they made because Serenity was gaining too much ground with the people. They feed Marco enough information to keep him loyal, but he is by no means in their inner circle. But most importantly, Marco has agreed to die for his cause. His cause, as the representatives understand it, is taking out the king and allowing the West to win the war. They expect him to lay down his life if that means killing Montes and Serenity without blowing his cover. So Marco has to juggle this with his allegiance to the king. And the king's end game is to kill all 13 representatives. Until that happens, Marco can't blow his cover as a mole and destroy the relationship with the West he spent decades building. Otherwise the plan he and Montes came up with--the one Montes tells Serenity about at the end of the book--would all be for nothing. I don't think there are too many questions concerning this, but I wanted to say anyway why I decided to make him the way he is. I think at our core, some things never change. A part of Montes will always be wicked. But, on the flipside, people do change. And Montes has had a long time to reflect on who he is, what he's done, and who he wants to be. Ultimately, he wanted to become someone he could admire, someone worthy of his wife's love. Throughout the books, Serenity is plagued by this question: can wicked people be redeemed? And I wanted to answer it through Montes, who's one of the evilest people she knows. If he can redeem himself, then she can redeem herself. At the end of the book, Montes explains to Serenity that he planned everything. Does he actually know everything? However, this is a man who has spent the last 100 years trying to (1) heal Serenity, (2) end the war, (3) cling to the wisdom and decency he's acquired over the decades. And Montes is a man who wants his cake and to eat it too. So he spent much of that time strategizing a way to get all of this, going through scenario after scenario of "what ifs". Even after all of that, he couldn't plan everything, which is why he and Serenity almost died several times. To some degree, I did want him to seem omnipotent (even if he wasn't). I wanted to make sure that this unnatural--almost supernatural--aspect of his character that always spooked Serenity shined through all the way to the end of the series. Alright, that's all I got for now, but if you have other questions, email me and I'll update this with your questions! I have a surprise for you all! So today … isn’t May 15, but it is the day The Queen of All that Lives (The Fallen World #3) releases! For those of you who’ve been waiting, I really wanted you to have the weekend to read the novel! So, without further ado, you can find The Queen of All that Lives here. For those of you who haven’t yet read my new adult post-apocalyptic series, the first two books are currently on sale for $0.99 each, and you can find them here! However, that sale ends tonight, May 13, at midnight (West Coast time), so there are only a few hours left. The Queen of All that Lives was probably one of the hardest (and most rewarding) books I've written. It was far longer than the other two in the series, so it simply took longer to write. It was also so heavy, and heavy can be really hard headspace to be in day in and day out. But I'm in love with the end result, and I hope you, too, enjoy this final installment in The Fallen World series. Anyway, have a great weekend you all, and thank you for taking a chance on my books! You are what makes my job so special. Ahhhh! One more week! On May 15, The Queen of All that Lives (The Fallen World #3) will hit shelves, and today I have the final teaser for you. I know what you all want to read--what happens when Serenity and Montes meet. And I reeeeeaaaally don't want to give anything away, so the following snippet is my compromise! I hope you enjoy it! They take me to a room I assume is used for extravagant parties, judging by how large the double doors are. We stop in front of it, and one of my guards knocks. No one answers the door and no one responds. I cast aside glance at the soldiers. They don’t appear surprised about this. What is waiting for me on the other side? They pause for several more seconds, then reach for the doors. As soon as they swing open, my breath catches. If parties were once held in this room, they are no longer. A world map covers the far wall. The same hated strings and blacked out faces are pinned to it. But the two adjacent walls, those are filled from floor to ceiling with photographs and reports. Conquering has become Montes’s obsession, though obsession is not nearly a strong enough word for this. Right in the middle of the room, staring up at his enormous map, his hands clasped behind him, is the one man I hate more than any other.